Well... after dealing with the undersized BS table for a year, I decided it was time to make something bigger. But, I was also having problems with the shorter fence for taller resawing projects, and hanging on to small logs while slicing them up so I made this sliding, adjustable fence. It has holes in it so I can screw a log on and slice away.. The distance to the blade is easy to adjust with the knobs in the back. Then just slide the fence closer or further away. I still need to work on the table track so I can adjust for drift - but for now this blade is tracking well and isn't giving me any problems.. I'm sure it's going to be one of those things that doesn't get worked on until I actually have an issue - but for now it's working great. Even just as a larger table surface. This is how the BS Table is currently mounted. One of these brackets on each side. Probably not how I'll keep it - because I want to make sure it's square to the factory table each time I put it on without making all kinds of checks - so I'll send you a new pic once I get it changed... For now though - this works just fine. Great design. Necessity is the mother of invention (or modification). What blade manufacturer are you using? Timberwolf, Woodcraft bands, and Olson. Want to try a lennox blade - but haven't ordered one yet. Hey, that looks pretty slick! Is that Melamine you made it out of? Is that a Grizzly G0555 14" er? 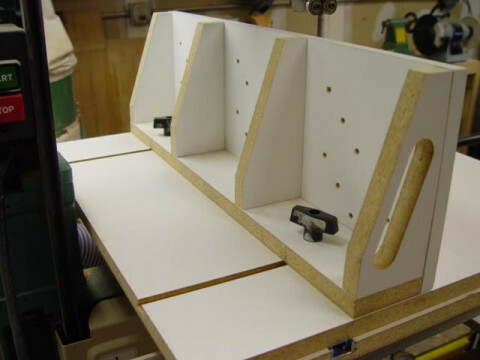 I have a G0555 but I have not tried to resaw much more than abt 4" so far... I like the present table / fence setup. 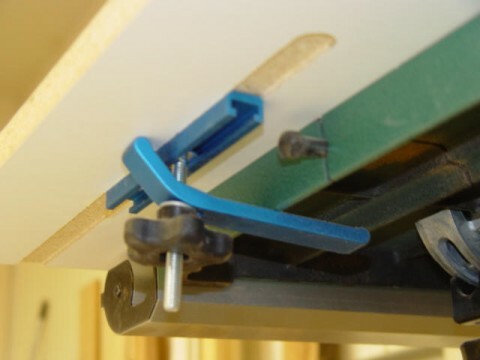 Great idea, I was just looking at a jig like that and it cost well over 100 bucks, I just might have to borrow your idea and save some money. Thanks for sharing! Yes - it's all melamine. A couple T-tracks from Rockler and a couple T-bolts / knobs... that's it. Oh... and a couple of the hold down clamps to hold it on the BS..
Don't get me wrong, I like the table and fence that came with my G0555, just that sometimes I need the bigger table surface for support. The fence rails are still attached, and removing the new table only takes seconds. I only use it when I've got larger pieces / logs to work on..
Just that every once in a while - every tool can use a few jigs. Right? Very, very nice. I've got some new ideas to work off of now. I have the riser block but have not installed it yet... glad it can handle the job OK! 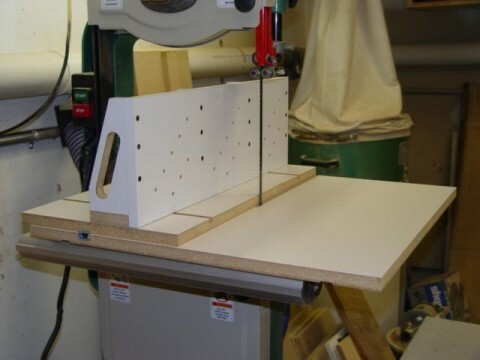 I like your Band Saw table as well as your jig! If I have your permission, I'd like to grab your writeup and place it on my Page. 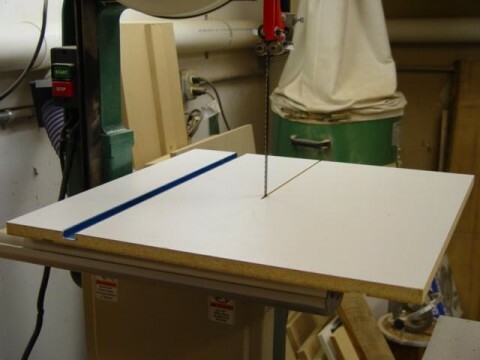 Do you think you could show a picture on how your Table is mounted to the Band saw? It would make it a little clearer. Nice job. It looks like a great design. I've never resawn any logs, but have seen jigs for doing so, and I think yours is better than any I've seen. What kind of logs are you slicing? P.S. Hey Mark, I see your using Picturetrail now. Did those rascals at Imagestation finally bust you too? Do you prefer one over the other for resawing. I have been using a vermont and was considering trying an olson or timberwolf just to see the difference. I resaw up to about 5" and haven't had any problems except the speed is pretty slow on the hard stuff. I have heard nothing but good raves on the Timberwolf, but not a lot on the Olson. Is the Lennox supposed to be any better than the others or are you just curious? Currently sawing up some wild cherry, Maple, and a little Oak.. Mostly for turning - but may slice off some small boards for drying..
Not a huge difference between the different blades I use.. At least nothing huge. I like to use the Timberwolfs for resawing, and mostly use a 3/16" olson for small radius curves.. I want to try one of the Lennox Carbide blades just to see if they last long as long as they advertise..